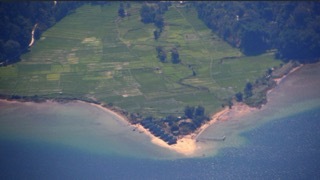 Welcome at Tando Bone bungalows at Lake Poso, Central Sulawesi, Indonesia. In the Pamona dialect 'Tando Bone' means 'Sandy Land-tongue'. The Tando Bone hotel bungalows are located on the eastern shores of beautiful Lake Poso; the pure and enchanting highland lake amidst the sloping hills and primary rainforest of Central Sulawesi. Tando Bone is reached by boat from Tentena in half an hour. Tando Bone is also reached by car in half an hour from Tentena followed by a five minute boat ride from the Tando Bone garage. The Tando Bone-site is 1,5 hours from Poso at the 'Gulf of Tomini', 6 hours from Palu, 5 hours from the National Park Lore Lindu and 10 hours from RantePao in Tanah Toraja (that is, with public transport; the region can more comfortably and easier be explored by rental car). Bungalows can be rented for 1 day up to one year. 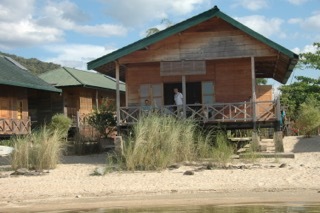 The bungalows are fully furnished and self-contained with kitchen, toilet and shower facilities. For more information see 'Bungalows'. At 515 meters altitude the 37 kilometers long and 13 kilometers wide (at its widest point, that is) fresh water lake is bounded by steeply sloping mountains on the west and the gentle hills of the east-side where Tando Bone lies. Nearby attractions include the Lore Lindu National park, the Bada Valley with its mysterious megaliths, caves in and around Tentena and the splendid Saluopa waterfall.